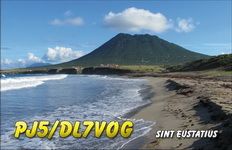 Sint Eustatius became a special municipality within the country of the Netherlands on October 10, 2010 and is one of the newest DXCC entities. It is located southeast of Sint Maarten and northwest of St. Kitts & Nevis. It is only about 21 km² (8 sq miles) “big” and counts about 3000 inhabitants. 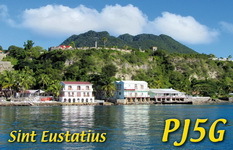 During the 17th and 18th centuries, Sint Eustatius was a major trading center in the Caribbean with more than 20,000 inhabitants. At the end of the 18th century Statia lost more and more of its importance and many merchants and farmers emigrated, leaving their homes and warehouses. Nowadays Statia is a remote and quiet place far from mass tourism but always worth a visit. Statia is a paradise for SCUBA divers - real great stuff!!! Sint Eustatius is a CEPT entity so you don’t have to apply for a guest license. Normally you can work with a PJ5/homecall call sign but if you want to get any PJ5(X) call only for any contest (usually 2 days) send an email to j.peters@btpu.org and he will send you an application form. Licence fee is 56 US $ plus 5,40 US $ bank transfer fee.